Google AdWords is a great traffic platform for digital marketing because you can present ads to people when they are actively looking for a solution. Google’s AdWords program shows ads to people based on the keywords they type into the Google search engine. For example, if a searcher types “buy dog treats” into Google, a company that sells dog treats can place a bid to show an ad on the results page. People use Google to research products and services, and the search queries they type in offer insight into the pain points they face and the solutions and benefits they are looking for. 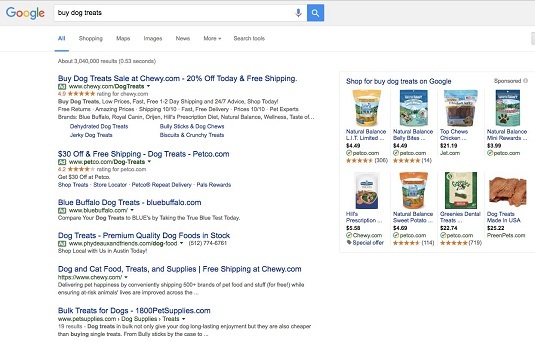 Ads appear for the search query “buy dog treats” on the Google platform. In comparison to other platforms, Google ads are seen as less interruptive and invasive, and they require less of an introduction to your prospects because people are actively searching for a solution. Although AdWords is generally more expensive than other traffic stores, it is very effective at generating high-quality leads and customers: Even though they may never have heard of you, these potential customers actively seek solutions and are often more open to becoming leads and customers. You need a goal: AdWords isn’t a platform you just get on to run some traffic and test your market. Deciding on a goal before you begin your campaign is imperative. If you’re new to this, you may want to start with another traffic store that is cheaper, such as Facebook, to test the market before you graduate to AdWords. You pay based on clicks: You pay only when someone actually clicks your ad (which helps to control your budget). You can target by location: There’s a big opportunity for geo-targeting for local businesses, so you can specifically “speak” to local markets. This feature works well for both local businesses and larger companies looking to segment a national or international campaign. Use tools to help you find keyword ideas and estimate how the keywords may perform. Google Keyword Planner is such a tool and is a free service provided by Google AdWords. Enter keywords and keyword phrases related to your business. Use spy tools such as iSpionage, SEMrush or SpyFu to research your competitors or other companies in your niche to gain insight on the keywords they’re targeting. If you have the exact-match keyword [lawn service] in your AdWords campaign, the only time your ad appears is when someone types the search query lawn service into Google. Your ad would not be triggered by those search queries because the words lawn and service do not appear in the same order as they do in the campaign. Broad match: With broad match, Google shows your ad for similar phrases to and relevant variations from the keyword. This includes plurals, synonyms, misspellings, and related searched and relevant variations. In contrast to the other keyword match types, broad match has no symbol designation. While this can place your ad in front of a large audience, it may not place it in front of the right audience. Because broad match can trigger so much, it’s not recommended for someone just starting out in AdWords. Select the Manually Set My Bid For Clicks option, which allows you to be in control of your budget. Otherwise, your budget is automated by Google AdWords. When first starting a campaign, use a default bid of $2– $3 until you can see how competitive your keywords are. Set a daily budget, again to keep your budget under your control. Include a call to action. What is the ultimate action you want your target audience to take after people have read your ad? Tell them what you want them to do in your ad. Calls to action can include “call now,” “download your free report,” and “order today,” among other possibilities. Use your keywords. Include the keywords you are bidding on within the ad’s copy. Not only does this help with your Quality Score (the algorithm that Google uses to determine how much you ultimately pay for a click), it also bolds the keywords that match a person’s search query, which makes your ad stand out more. Reference holidays or local events. When your ad mentions upcoming events or holidays, it seems more timely and relevant to searchers.